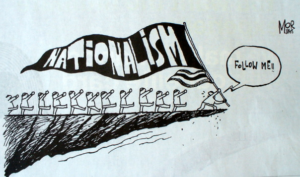 Can we live as Nationalists when the world is so small? Does globalism wreck countries? Trading between countries is an absolute necessity for any First World nation. We import resources from countries around the globe to make the goods we need in today’s world – or more and more, buy the finished products, more cheaply produced abroad. Does that mean there should be no limits on trading, a true global economy? If each country is enmeshed in its own unique economy, some having large scale trade and others smaller, then the trading is not equitable. Can one country continue with human rights violations while trading with countries that won’t tolerate such violations? There must be some type of regulation, some ‘rewards and penalties’ for behaviors that enable disparate trading. What would happen if suddenly all trade between countries stopped? Most United States manufacturing and production companies would come to a near, if not a screeching, halt. Can the United States manufacture the rare earth minerals needed for simple, everyday use items such as lithium ion batteries? Think about what an effect a curtailment on world trade would have on, say, all the coffee aficionados in the world. What about spices? To drill down to everyone’s concern, how could modern technological society function without petrochemicals? 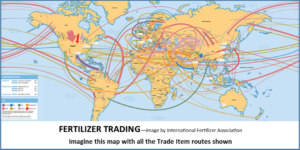 No, trade has been around forever and we as nations have formed – albeit, sometimes shaky – relationships to enter into trading arrangements. People who feel they need to put their nation first (nationalists) don’t take into account that we already have a global economy. People who feel that we just need to open borders and let the trading begin (globalists) forget that not all countries wield the same influence and ability to attain equitable influence for their products and services. The middle ground could come in the form of a Technocracy, which would take away the power of money, and put the power into an environmentally and societally friendly form by requiring that each item be valued by its impact on society and the environment. No arbitrary ups and downs, no valuation by advertising, but valuation by actual value to humans and our home, the planet. In an increasingly commercial culture in which everything that can be of use to humans has a price on it, it is hard to imagine a world in which those with the most money do not control the world. But it is possible, and doable.